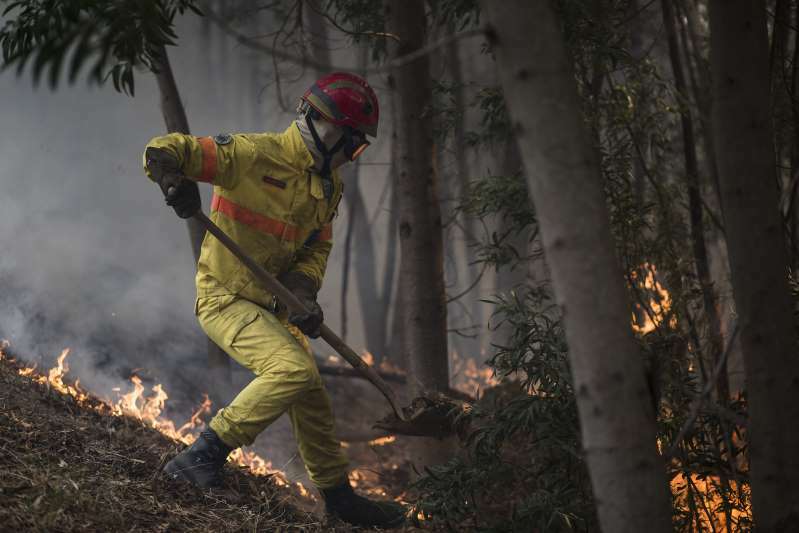 Emergency services in Portugal continued their fight Monday against a major, four-day wildfire on the south coast that threatened to engulf a hillside town overnight. [post_ads]In France, where four nuclear reactors have been temporarily closed due to the heat, three cities banned the most polluting cars from the roads because of heat-linked ozone pollution. After four days of intense heat that broke some records in Portugal, with temperatures surpassing 45 C (113 F), Portuguese authorities forecast a cooler period beginning Monday. The Algarve wasn't expected to exceed 30 C (86 F), while Lisbon was expecting 33 C (91 F). Parts of the south and northeast of the country remained at "extreme risk" of wildfires, however, according to the national weather agency's forecast. The falling temperatures helped create "much more favorable" conditions for firefighters tackling the Monchique blaze, local fire chief Abel Gomes told a news conference. The wind-driven fire has been racing across tinder-dry pine and eucalyptus forest in a largely inaccessible hill range behind the famous beaches of Portugal's Algarve vacation region.